2 5/8" (16mm) custom precision dice. In 2016, Battleschool announced a new series of 5/8″ (16mm) custom precision dice, a series that focused on the Waffen SS. There would be eight dice in all, sold in packs of two (or also available individually). 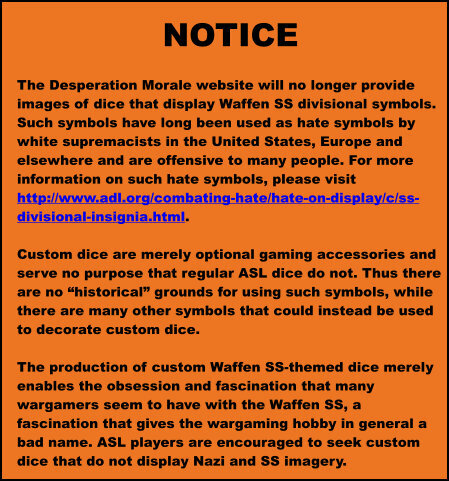 Seven dice would each feature the divisional insignia of a Waffen SS unit, while an eighth die would be white and apparently feature SS lightning bolts. This was a lamentable decision as all of these symbols are common hate symbols used by white supremacists in the United States, Europe, and elsewhere. Because these dice are optional accessories, there are not even faux “historical” rationalizations that can be employed to defend the sale, purchase or use of such dice. This particular offering in the series features a die for the 2nd SS “Das Reich” Panzer Division and a die for the 3rd SS “Totenkopf” Panzer Division. It should be noted that the divisional symbols used for these two units are extremely popular among white supremacists and a number of hate groups even include them as part of their logos. 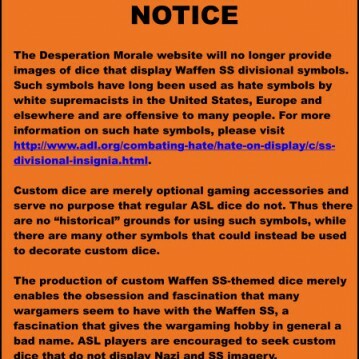 Desperation Morale does not condone these dice and will not display them on its website.